They are used in agriculture. Necessary for pulverization, and the fluffing of soil, crushing followed by cutting of weeds, soil compaction and leveling. In this period of time necessary to produce mineral fertilizers, and ridging of crops by applying fertilizer distributing machine. This shows the large number of possible operations and the possibility of their performance during operation only one unit, allowing to optimize the costs of time and money. Resource-saving mechanism is not only useful in the processing of large, but also small areas. Before you buy cultivator KRN need to find out the possibility of aggregating it with the available in your farm tractor. For your information, it is aggregated with tractors of class 1.4 or higher (MTZ-80/82, UMZ-6). 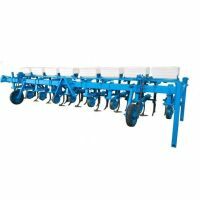 This cultivator complement the center. beam, a set of fasteners (hardware) for mounting the working bodies, the bracket wheel, which is equipped with wheels, the transport device, a uniform lock paws lancet with racks set parking supports, the left-hand or right-hand fluke-razor with a rack. On request, doukomplektovyvat basic equipment chisel legs required for entry into the soil of various mineral fertilizers, fertilizer machine, ripping chisel legs, Hillers with stand mi. Parts manufacturing facilities for tractors and combines on your drawings! If it is not found in the needed parts catalog, the Motor-Agro experts as soon as possible ready to make it in the required amount according to your drawings.